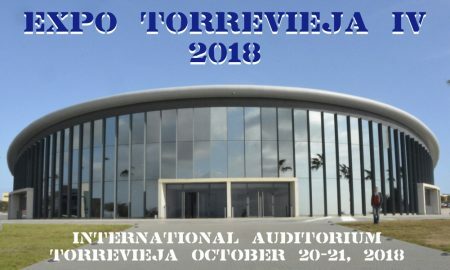 Internacional Expo in Torrevieja at Auditorio Internacional de Torrevieja, Saturday 20 and Sunday 21 October 2018. Following the success of Expo Torrevieja III, which attracted more than 70 exhibitors, from all types of industries, services and suppliers, Expo Torrevieja will be returning to the region’s most prestigious facility, Torrevieja’s International Auditorium. Some 12,000 visitors visited the Expo III and were treated to two days of exhibitions and demonstartions. The busy Clubs, Charities and Associations section was very popular and every exhibitor was delighted with the success of the event. The next event promises to be even more popular and we expect more exhibitors and visitors in October. Quality Driven:enhancing your quality of life. The International Auditorium is the largest indoor venue available on the Southern Costa Blanca. It features climate control, safe, secure and easy parking, great lighting for both daytime and evening and has an instant WOW factor not found in and other venue in the Southern Costa Blanca. During the month of October, when the possibility of rain always exists, it’s our pleasure to welcome you to the beautiful International Auditorium in Torrevieja. Saturday 20 October from 10:00 – Open to the public. Sunday 21 October from 10:00 – Open to the public. Visit www.expotorrevieja.com for more information. Look forward to seeing you at our FOURTH Expo Torrevieja.